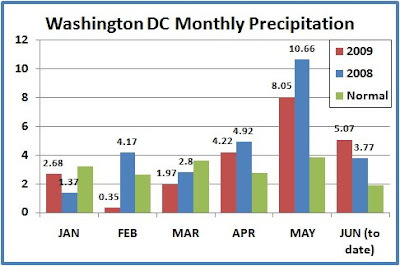 At Washington National, the month is 3.18" above average to date, and the year is 4.42" above. For the year, this is still over 5" below last year's soggy pace, however (27.69" to date). The Eastern Pacific hurricane season kicked off just 2 days short of the record latest opening in the satellite observation era with the formation of Tropical Depression 1-E this morning off the Pacific coast of Mexico. As of 2 pm PDT, the storm had maximum winds of 35 mph; it's expected to reach tropical storm strength before making landfall on the west coast of Mexico late Friday or early Saturday. A Tropical Storm Watch is in effect for portions of the Mexican Pacific coast. Lobbying is being committed in the climate casino! known track record of policy advocacy and bogus science, holds a PR fest in NYC in March, and the intrepid junior journalist from Capital Weather Gang/WaPo proves he's the next Woodward/Bernstein by dutifully regurgitating a standard corporate-media "he said, he said" piece pimping a false equivalence between the Heartland's PR and a real conference in Copenhagen. Then Bullwinkle and Bast's Traveling Bad Medicine Show takes a ride on the shuttle and sets up its tents in Spin City. Our jr. journo finds a decoder ring in his Froot Loops and has a great revelation: There's lobbying going on in the climate casino. Then, after more than 2 weeks of brewing (original conference date: June 2) in the bowels of the WaPo editorial bureaucracy, this news flash emerges: The policy advocacy group is actually advocating policy! Tell me again: Who was it who reversed position? Is smoking still good for you? Is Al Gore still fat? And where should the Pulitzer Committee mail the Prize for Disingenuous Reporting? Who subsidizes this incompetent and/or dishonest foolishness (besides the slave-labor union-busting "bloggers" who work for sub-sub-minimum wage at WaPo online)? Let's take a glance at the WaPo's carbon-based edition. "Let's make global warming about the science again . . ."
"The debate over global warming is supposed to be about science . 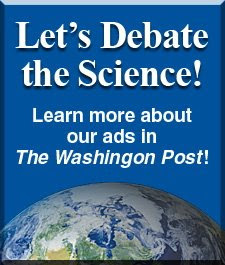 . . "
"More than 31,000 American scientists have signed a petition . 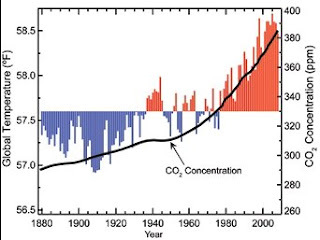 . ."
NOAA's National Climatic Data Center (NCDC) reported on Monday that May 2009 had the fourth warmest global average temperature in 130 years of data. Most land areas were above average in temperature, with the warmest readings relative to average in Alaska, Iceland, the western contiguous U.S., and much of Europe and Asia. Cooler-than-average regions included New Zealand, Canada, and parts of western and central Asia and Australia. Large portions of Canada were 2-5°C (4-9°F) below average. Sea surface temperatures were above average over most of the oceans; the notable exceptions were parts of the northeastern Pacific and central Atlantic. During May 2009, above-average precipitation fell over areas that included southeastern Asia, the southeastern contiguous U.S., northeastern Brazil, east central Australia, and parts of Russia, northern Europe, and northern India. Drier-than-average conditions were present across the Hawaiian Islands, Alaska's panhandle, the central U.S., northeastern South America, southern Europe, eastern Asia, and most of Australia. In a Tropical Update report Tuesday evening, The Weather Channel's tropical expert Dr. Steve Lyons reported that the eastern Pacific hurricane season is nearing a modern record for latest start. Since the beginning of the satellite observation era in 1965, the latest beginning of the season in that region was June 20, which is now only 4 days away. As of 5 pm PDT, however, the National Hurricane Center was identifying an area about 350 miles off the coast of Mexico as having a high probability (over 50%) of developing into a tropical depression in the next 48 hours. The findings are a game-changer. Much of the foot-dragging in addressing climate change is a reflection of the perception that climate change is way down the road . . . This report demonstrates, provides the concrete scientific information that says unequivocally that climate change is happening now, and it's happening in our own back yards and it affects the kinds of things that people care about. The U.S. Government's Global Change Research Program, a joint activity of 13 departments and agencies, this afternoon released a report, Global Climate Change Impacts in the United States. The report "summarizes the science of climate change and the impacts of climate change on the United States, now and in the future." It is the "first report in almost a decade to provide an extensive evaluation of climate change impacts on the United States at the regional level." The 189-page report is available online to download in full or in part, and is also being published by Cambridge University Press. Widespread climate-related impacts are occurring now and are expected to increase. Climate change will stress water resources. Crop and livestock production will be increasingly challenged. Coastal areas are at increasing risk from sea-level rise and storm surge. Threats to human health will increase. Thresholds will be crossed, leading to large changes in climate and ecosystems.